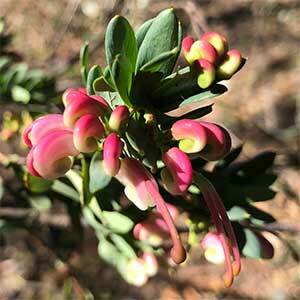 This is a compact hardy shrub and Grevillea baueri tolerates both cold and drought. The dense growth habit makes it a haven for small birds. Flowers are pink and cream and again attract nectar seeking birds to the garden. This is a good plant to grown the general garden border, or it can be be used as a low informal hedge or border plant. As a hedge try a spacing of around 1 metre. Another form G.baueri Asperula is also available. Light tip pruning will maintain a smaller plant with a dense habit. Spread – To around 2.5 metres. Foliage – Mid green, oblong shaped and dense growth habit.